The main drink that I have been craving lately (besides water and fruit juice) is "iced coffee" that I make myself. Now you can just buy a ready made one, but where's the fun in that? I add a lot of ice as it cools me down, once I have finished the iced coffee I am left with coffee flavoured ice cubes which taste amazing! The caffeine in the coffee also gives me a nice boost, but use decaff if you are wary. Yum! 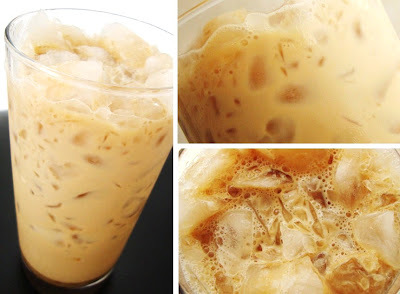 I love iced coffee........it's my favourite breakfast drink ever! @Superficialgirl I still need to buy some decaff for night time cravings :) very fine crushed ice sounds lovelyyyy, I will try that too! I am not really fond of coffee at all, but those pictures and your description really made me want to try this! I will try to do this as soon as I get home today. One question: Do you use any special tool to stir it all, or just a spoon? Yums! That looks gorgeous! I'll try your recipe for sure! I love cold coffee drinks - and yours looks so pretty! Thanks sweety! I will try it your way! I lurve iced coffee, all the time! I love iced coffee...another great tip is to add a scoop of vanilla ice cream instead of the sugar :) so nice and refreshing! I wish I liked coffee! i am obsessed as well, but i drink instant coffee (Neskafe as well) but you just need to add cold water and/or ice cubes. I absolutely share your love :P perfect summer drink :))Thanks for sharing your recipe! Ah, what a good idea. I've only ever drank this from shops never home made! which shade from ysl touche eclat r u using? im confused which one for me between no 1 or no 2 ? when can i put above or under my concealer or foundation? love iced coffee as well..
Thx for posting this Muhsine. I've been having iced decaff (only ever drink decaff)ever since I read this post and am totally hooked! Hope we get some more hot days so we can all beat the heat with this very yummy treat! i just made this! yummy!! thanks so much for the recipe! What a great recipe! Thanks for the idea, will definitely try it out once the weather gets a bit better.